This tour will take your breath away! Taking you to the far north of Scotland including two night stay in Inverness, Captial of the Highlands. Join us as we ‘go wild’ for three days amid some of Scotland’s most stunning scenery. See local birds and wildlife in their naturally beautiful habitat, from heathered hillsides to coastal waters. We start our first day by way of Rannoch Moor into atmospheric Glen Coe, where we’ll stop for photos and the chance to take in the glen’s spectacular beauty. 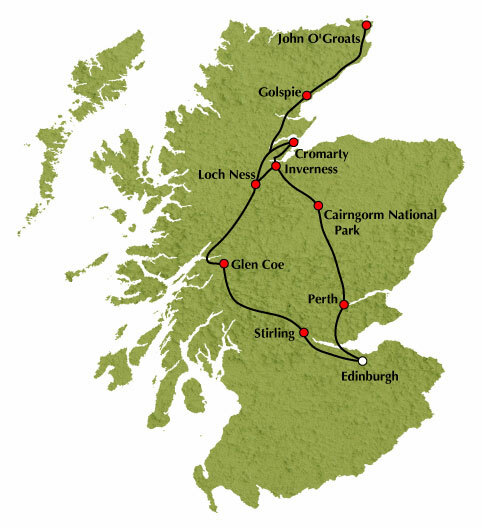 We continue to Fort Williamon the banks of Loch Linnhe and in the shadow of Ben Nevis, Britain's tallest mountain, then through the Great Glen, with its loch-side views, until we reach mysterious Loch Ness. We pause again here so you can visit Urquhart Castle and take a short cruise on Loch Ness *. It’s then just a short drive from the loch to Inverness, the Capital of the Highlands and our home for the next two nights. Your stay in Invernessis unescorted, so you can enjoy your free time here as you please. We head across the Black Isle to the Cromarty Firth where you may see seals, depending on the tides. Our first stop is in Golspie, where a 27m (90’) statue of the first Duke of Sutherland stands high above the town. The duke’s agents were involved in the most notorious of the 19th-century Highland Clearances. Our next stop is in John O'Groats , the most northerly point of the British mainland, with time for pictures to capture your "I was here!” moment. We next make our way to Duncansby Head for an easy stroll along the cliff-top path for dramatic views of sea stacks and seascapes, as well as sightings of local birdlife such as guillemots, kittiwakes and, of course, cheeky puffins (until late July). Take advantage of the binoculars available on our mini-coach for a close-up view. This morning’s excursion takes us through the Black Isle to the picturesque village of Cromarty. Later you can enjoy some free time in Beauly before we join our motorcoach for a spectacular drive through the Highlands. From the Spey Valley and the beauty of the Cairngorm National Park, our coach travels through the Pass of Drumochter to offer scenic views as we make our way through Glen Garry. After a short break, we return through the rolling Perthshire countryside to Edinburgh. Tour Highlights: Rannoch Moor, Glen Coe, Fort William, The Great Glen, Loch Ness, Inverness, The Black Isle, dolphin-spotting, pre-historic sites, woodland walk, John O’Groats, Duncansby Head, Wick, Beauly, Cromarty, Spey Valleyand Perthshire.